Kobow is a good place to drop by if you're looking forward to a heavy lunch. We were looking for a place to eat in the Chinatown area near Paddy's Market when we glanced at this restaurant promoting a $10 lunch buffet. We brought packed lunch for that day so we decided to just come back the next time we were around the city. 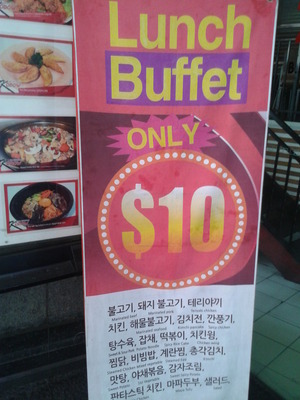 Sure enough, when we happened to be in the vicinity of this Korean Restaurant we decided to check out their lunch buffet. The choices are varied enough and familiar enough to most people who are looking for an Asian-themed lunch. You have the option to pair up assorted chicken, pork and beef dishes with either rice or noodles. The salad bar offers a couple of choices to mix and match a couple of greens. There are also some ready-made salads that are quite tasty as well. A little bit out of place for me where the chips on one side of the buffet table. Maybe they are for those who still are not used to eating with rice and would rather have potatoes for their carbs. Or maybe they're just for the children who can eat free. They also provide free hot tea which is quite nice since it's a good way to cleanse the palette after the intense and varied flavours one probably tasted after going back for seconds or thirds. The place could sit probably around 30 people comfortably and the decor gives just the right feel to the place. Whenever I go to Japanese themed food stalls and I see the familiar entrees that sell for $7-$10, I usually remember this place and wonder when I can go back here again.